A public character prominent in his day for wealth and influence; born about the end of the fifteenth century at Derenburg, near Halberstadt; died in 1549. He was described as of imposing appearance and eloquent of speech, and was regarded as an illegitimate son of one of the counts of Regenstein. His wife, Merle, was the daughter of Joseph of Schleusingen. Michel, being well-mannered, was received by princes and nobles, who courted him on account of his wealth. The elector Joachim of Brandenburg, Duke Friedrich of Liegnitz, and Landgrave Philip of Hesse were among those who maintained relations with him. On July 25, 1529, Duke Erich the Elder of Brunswick-Lüneburg, ignoring the wishes of the magistrates of the city of Hanover, granted Michel permission "to build a house in the new city in the suburbs of Hanover" and to dwell therein with his wife, his children, and his servants. Besides the house in Hanover, Michel owned one in Derenburg, one in Frankfort-on-the-Oder, and one in Berlin. He was in the good graces of the elector Joachim II., who on Feb. 27, 1544, sanctioned the jointure settled by Michel on his wife. From Duke Erich Michel received important commercial privileges, and his business relations extended from France to Silesia and Poland. He played an important part in the imperial diets also. In 1548 he appeared at the Diet of Augsburg in very costly garments, wearing heavy gold chains around his neck, riding on a richly caparisoned horse, and accompanied by a retinue of ten or twelve servants, all Jews. Shortly afterward he was taken captive by Magdeburg knights on Brandenburg territory, but escaped, and on his accusation the knights were taken to Torgau and condemned to death by order of Joachim II. Count Ulrich of Regenstein, who hated Michel and is said to have published a pamphlet against him, was forced by Joachim to sign a treaty favorable to him on May 15, 1549. 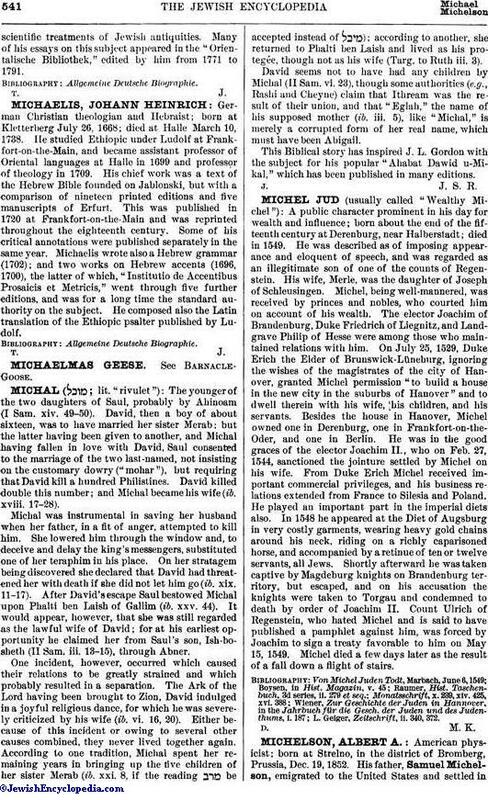 Michel died a few days later as the result of a fall down a flight of stairs. L. Geiger, Zeitschrift, ii. 340, 372.